First Solution Pest Control controls and eliminates roaches invading homes and businesses in Miami, FL. 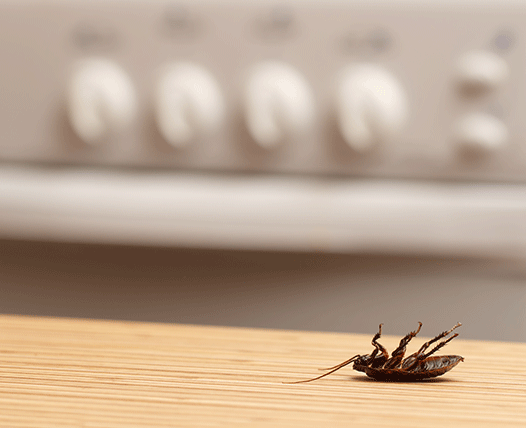 If you've seen a roach scurrying past you in your home, it's most likely a sign that more are lurking. Our experienced exterminators will perform a thorough inspection and rid your home of cockroaches using the most advanced systems. The German cockroach has two stripes on its back and invades homes in search of food sources. German cockroaches can quickly multiply and easily live off of minimal water and food in your home. Sewer roaches are an outdoor species that retreat to indoor spaces as refuge from hot summer temperatures. A sewer roach will make its way to your home through the plumbing system and tiny entry points. Whether your home is attracting indoor or outdoor roaches, it's important to have them quickly eradicated for your peace of mind and to prevent them from breeding. We'll make sure to inspect your entire property from your yard and outdoor structures to cracks and drains inside your house. Once we assess your pest problems, we'll customize a treatment program. We can destroy and remove cockroaches no matter where they're hiding. To ensure that they're gone for good, our services include prevention methods and advice. Cockroaches are resilient pests and we'll help you permanently eliminate them from your property. Contact us today by calling First Solution Pest Control in Miami for roach extermination services. Our exterminators serve the surrounding areas of Miami Beach, Kendall, Homestead, Coral Gables, Key Biscayne, Hialeah, Aventura, Pembroke Pines, Hollywood, Ft. Lauderdale and Davie, Florida.